Nicholas Hlobo's giant flying rubber dragon is part of German collector Jochen Zeitz's personal collection. Nicholas Hlobo is a South African artist, fast gaining an international reputation for his experimental use of materials. 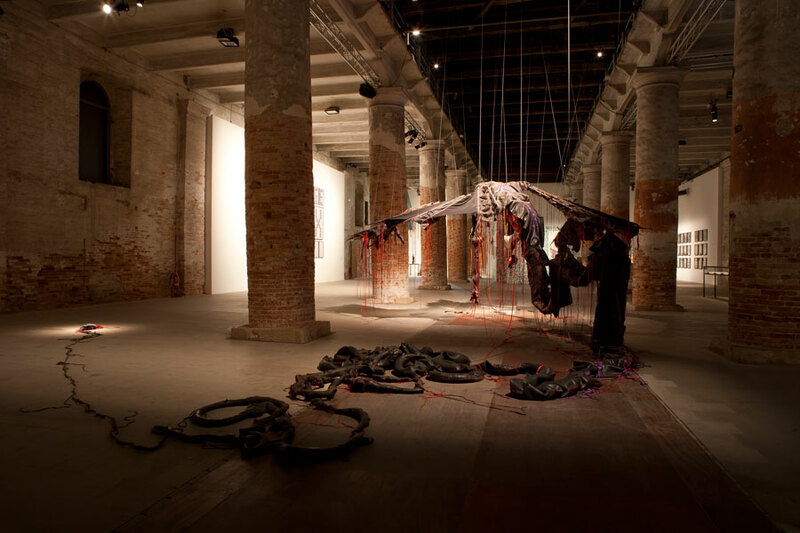 The giant flying rubber dragon, pictured here, was created by Nicholas Hlobo for the Venice Biennale in 2011. Soon thereafter the piece was bought by Jochen Zeitz, the German collector who is the chairman and chief executive of Puma. The piece is titled Iimpundulu Zonke Ziyandilandela, which in the artist’s native Xhosa means “all the lightning birds are after me”. The work is made of tyre inner tubes. The dragon bird is shown in flight with its wings extended and the long tail rolled into coils behind it, while red ribbons have been stitched throughout the creature’s body, stretching down to the ground beneath it. Mark Coetzee, the curator of Zeitz’s personal collection, described the piece as a Biennale “highlight”. Hlobo is said to have drawn inspiration for the piece from many sources, saying “I looked at a lot of paintings by Tintoretto and found that many of them had birds in them”. The title of the artwork, Iimpundulu Zonke Ziyandilandela, references a song about a mythological creature that “at times presents itself as a bird and at times as a handsome young man, but only to women”, Hlobo said.